The Surry with the fringe on top, by Mort Kunstler plate, second issue in the Oklahoma series. Includes original shipping box and Certificate of Authenticity. The first collector's plate series officially authorized by the estates of Richard Rodgers and Oscar Hammerstein II to commemorate the great American musical Oklahoma. 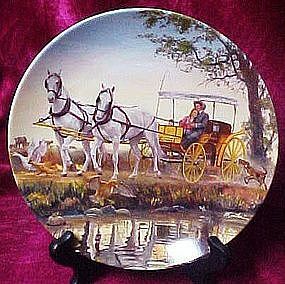 Painted exclusively for the limited edition by Mort Kunstler and fired on fine china by Edwin M. Knowles. Plate dated 1985. Certificate of Authenticity and original box included. Collector plate measures about 8-1/2 inches in diameter, no chips or cracks. Looks to have never been displayed. I will be listing other plates from this series.